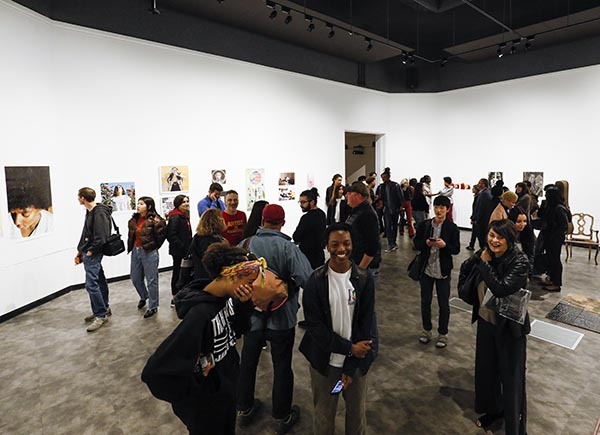 Visitors attend USC Roski School of Art and Design's 2018 Annual Student Exhibition at the USC Fisher Museum of Art. Photo by Brian Feinzimer/Capture Imaging. With a faculty of international distinction, the USC Gayle Garner Roski School of Art and Design offers emerging artists, designers, curators and critics a creative and intellectual atmosphere in which to study. Located at one of the world's leading research institutions, Roski encourages interdisciplinary exploration throughout USC's 18 professional schools — including six devoted to the arts. And by studying in Los Angeles, students can enhance their education with access to more museums than in other U.S. cities as well as an extensive number of galleries, design firms, artist studios and music and film industries, providing a wealth of internship and employment opportunities for a successful future. Roski's BA program is a liberal arts degree, ideal for students who want to combine art with a study in a related field — or a completely different one. Though the emphasis remains on a studio practice, the flexibility of the BA allows students to pursue electives, a minor or a second major to develop a diverse academic career. For a more intensive undergraduate arts degree, the BFA in Art program allows students to immerse themselves fully in the creative process, spending the vast majority of their class time in studio courses developing high levels of proficiency. A distinguished and dedicated faculty mentors art students in painting, drawing, printmaking, sculpture, ceramics, photography, digital media and critical studies. And the BFA in Design is a four-year, pre-professional degree leading to a variety of careers in advertising, publication, fashion, sports, entertainment and film design, among others. At the graduate level, the MFA in Art program is recognized nationally for its breadth and intensity, as well as for a faculty of renowned practicing artists. The two-year, studio-based program offers a multi-disciplinary platform for diverse and experimental practices. The school recently launched an MFA in Design, housed at a new facility in the Los Angeles Arts District — an imaginative, authentic urban neighborhood. The five-term, studio-based program encourages a unique and relevant contemporary design practice for a rapidly changing world. The third graduate degree offered at USC Roski is the MA in Curatorial Practices and the Public Sphere, a platform for scholarship in contemporary art. The program aims to bring students to a high level of understanding of the history and theory of curatorial practices, with attention paid to questions of how curating activates art in relation to a range of audiences and interacts with diverse communities. USC Roski encourages students to expand their horizons through a diverse community, global initiatives and interdisciplinary opportunities. These goals better prepare them to forge entirely new paths for an arts education, utilizing every advantage of a great university to drive change, challenge others and create a better future for themselves and for the world. At the undergraduate level, the school offers the Bachelor of Fine Arts in Art and the Bachelor of Fine Arts in Design. The Bachelor of Arts in Art is offered in conjunction with the Dornsife College of Letters, Arts and Sciences. The Roski School of Art and Design also offers 11 minor programs in studio arts and design including a 3-D animation minor in conjunction with the Viterbi School of Engineering's Information Technology Program, a communication design minor in conjunction with the Marshall School of Business and the Annenberg School for Communication and Journalism, and a 2-D art for games minor and 3-D art for games minor with the Viterbi School of Engineering and the School of Cinematic Arts. Degrees offered at the graduate level are: Master of Fine Arts in Art, Master of Fine Arts in Design, and Master of Arts in Curatorial Practices and the Public Sphere. A dual degree is also available: Master of Planning/Master of Arts, Curatorial Practices and the Public Sphere. A minimum grade of C (2.0) or higher is required in all studio and art history courses for all undergraduate majors and minors in the Roski School of Art and Design. A grade of C- or lower will not satisfy a major or minor requirement. A minimum grade point average of 3.0 must be maintained by all candidates for the Master of Fine Arts and Master of Arts. Admission to the Roski School of Art and Design at the undergraduate level is granted through the USC Office of Admission. Freshman applicants applying by December 1 for the fall semester will receive priority consideration for admission to the university and for merit scholarship. January 15 is the deadline for general consideration. The deadline for transfer applicants for the fall semester is February 1. Undergraduate applicants must upload a portfolio of images and an artist statement at the school's Website. Specific requirements and additional information are available at roski.usc.edu/undergrad or email roski@usc.edu. Students who have not been admitted to the Roski School of Art and Design may complete a maximum of 20 units of Roski course work at USC. No further course work may be taken until admitted. Students who are interested in becoming Roski majors or minors should meet with the Roski School's advisers as soon as possible, preferably during their first semester taking art classes. Advisers can be contacted through the school's Advisement Office, Hazel and Stanley Hall 101, (213) 821-1290, for assistance. Applications for admission to the graduate programs are evaluated by the USC Office of Graduate Admission before being forwarded to the school. Students must be admitted by both the USC Graduate School and the Roski School of Art and Design. The Graduate School's general admission requirements include official transcripts of all previous college and university work, and three letters of recommendation from instructors or persons able to comment on the applicant's creative work and/or scholarly potential. Applicants to the MFA degrees must upload a portfolio of images and an artist statement at the school's Website. Specific requirements and additional information are available at roski.usc.edu/academic/mfa. Academic advisement is provided to fine arts majors, minors and graduate students through the Advisement Office in Hazel and Stanley Hall 101, (213) 821-1290. All students who are interested in taking art courses are welcomed and encouraged to make an appointment for advisement as well. The staff advisers provide information regarding academic life at the university, program requirements, policies and procedures to assist students with their degree completion. Majors are required to meet with advisers before registering each semester. Appointments may be scheduled at most times during the academic year. For more information, see roski.usc.edu/resources/student. Roski majors may take advantage of art courses offered through study abroad programs. For more information, see Roski's study abroad page at roski.usc.edu/academic/study-abroad. Please contact the USC Overseas Studies Office in CAS 104, (213) 740-3636, or dornsife.usc.edu/overseas-studies/ for complete information, program requirements and applications. The Roski School of Art and Design offers minors in art and design as supplements to major fields of specialization in other departments and schools for students whose academic programs do not permit the opportunity to pursue one of the school's regular degree options. There are eight intensive studio minors — in painting, drawing, photography, ceramics, sculpture, two-dimensional studies, digital media-based imaging and 3-D design — as well as interdisciplinary minors in communication design, 2-D art for games and 3-D art for games. There is a separate application for Roski minors available at roski.usc.edu/academic/minors. Candidates for the minors in the Roski School of Art and Design will be counseled by an academic adviser in the school.